CyanogenMod ROMs give Android users the latest Ice Cream Sandwich or Jelly Bean treats to their otherwise-neglected smartphones, and it's mostly open-source except for one piece: the boarded-off ROM Manager. To remedy that, the modding organization is bringing its OTA updater back from the CM5 and 6 graves, letting users pull updates straight to their devices. Notice we say "pull," because pushing would require the Google Apps framework, which the CM updater won't have. 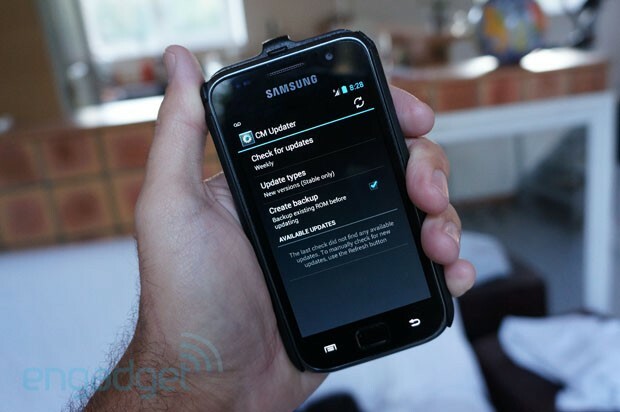 However, as the screen above shows, you'll be able to set a timeframe to check and grab the latest versions directly from CyanogenMod's servers, and after flashing yesterday's CM10 ROM, we can confirm that the software is working on our Galaxy S. That'll bring a much-needed dose of simplicity to upgrading CM firmware and make all that modding slightly more mainstream.